A Luxurious Boutique Hotel Featuring an Equestrian Experience. Located in the mountains of southern Costa Rica is an agricultural area with stunning valley views. 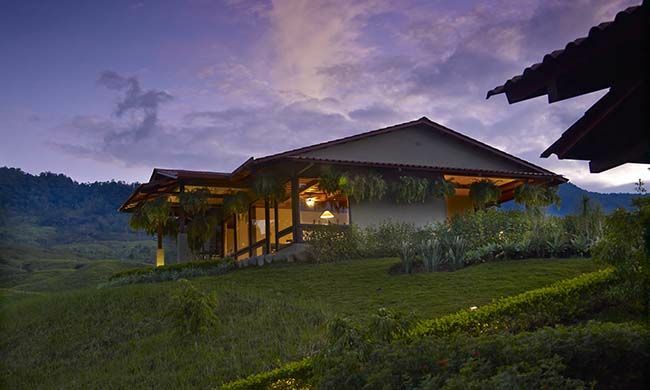 Here you will find the Hacienda AltaGracia. This luxurious boutique hacienda is ideal for couples or special events. They specialize in an exclusive equine experience featuring purebred horses, riding trails around the property, 28 stables, a riding school, and space for events. AltaGracia is comprised of 50 elegant casitas (bungalows) decorated with warm woods and leather accents. Each has a panoramic terrace, private bar, and luxurious amenities. With extras like A/C, heater, LED TV with Netflix, iPad, and docking station, you will have everything you’ll ever need. All but the Deluxe suites feature a butler pantry and fireplace as well. Some hotel amenities include 24-hour room service, concierge and valet, high-speed WiFi, wine and gift shops, a pillow menu, and laundry service. In addition, guests will enjoy a specialized tour of the impressive hotel grounds. The hotel chef is winner of multiple international awards and offers creative culinary options specializing in fusion and local cuisine. Vegan and gluten-free menus are available upon request. At the three on-site restaurants, you will enjoy fine dining with either panoramic vistas of the green hills or a front row view of the riding ring. Breakfast is included in your stay. Arrange a romantic dinner at sunset by the fire pit, hang out playing billiards or board games, or plan a private movie screening. More on-site activities include the special ultra-light tour from the hotel´s private airstrip, ATV, mountain biking, hiking, picnics and a coffee tour. Other highlights include unique cultural tours such as farmers market visits, cheesemaking, and an indigenous village tour. With national parks, beaches, and other well-known Costa Rican activities nearby, you can customize your experience any way you like! One of the highlights of the resort is the spa, which is one of largest and best in Central America. It offers six indoor treatment rooms, including two couples rooms, as well as four outdoor treatment rooms for those who want to take advantage of the surrounding natural area. You can also enjoy one of the two aqua suites with Vichy showers, soaking Jacuzzi tub, and outdoor garden. The installations also include a panoramic pool, a state-of-the-art fitness center, Jacuzzi, sauna, relaxation lounge, and even a beauty salon. Horse lovers will appreciate this unique equestrian experience with purebred horses, plenty of riding trails, and more. During the ultra-light plane tour, you will glide over the valley where you can see the rich biodiversity of the area as well as some landmarks and cities–not to be missed! The Manantial Spa is one of the best in Central America and offers many relaxing treatments, including some designed especially for riders! The carefully planned casitas are top of the line and the valley views are hard to beat.